First I will show you today's new fashion: it is a pretty tee-shirt with fancy lace sleeves. Well, I am not exactly sure if the sleeves are lace or crochet. And there is a pretty pink flower on the front! You already know that I model for treats, so I will show you more about this. We just started and I am already drooling! Come on, Mommeh, give me the treats already! (Mommeh has paint on her fingers from a painting project). HEY! I am waiting for more treats. My mouth is open and waiting, hurry up! MMMMMmmmm, lip-smackin' good. Thanks, Mommeh! 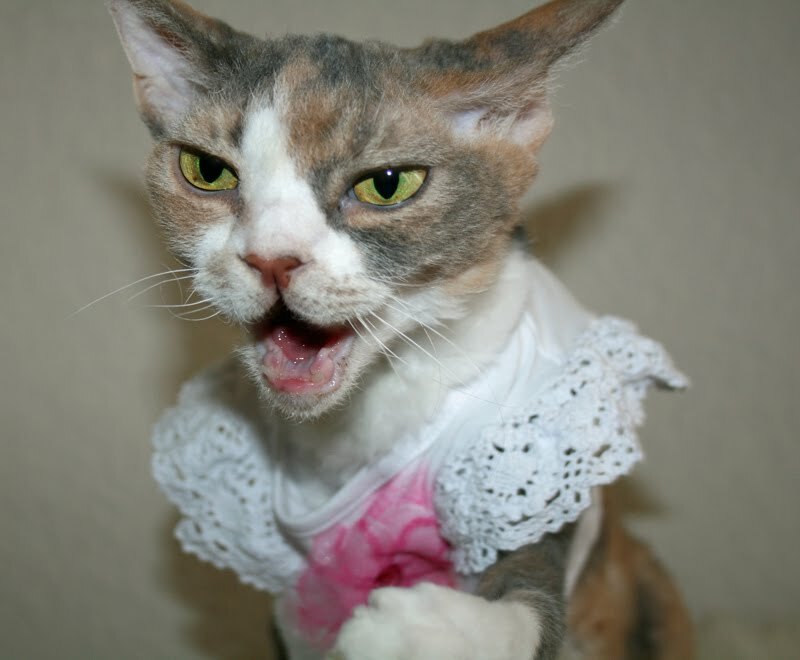 ohh Sweetie - you look so cute in your pink outfit and do such a good modeling job. 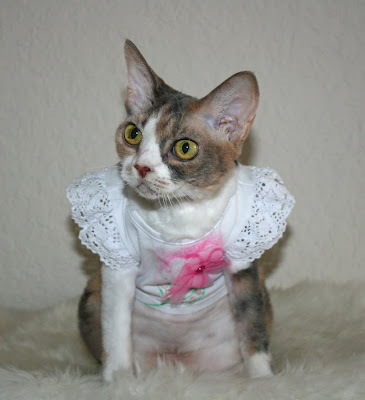 That is a very pretty tee shirt with dainty sleeves.You are the best model we know. I, Flynn, always crunch my treats nicely, but Eric swallows his whole. What a lovely shirt that is, Daisy! And getting treats for modeling it is an added bonus! That's a really cute t-shirt, Daisy! Looks great on you! I hope I don't offend you, but the 'treat faces' are pretty funny! You made my day! That sure is one pretty t-shirt Daisy. We love how you take your treats. We can tell that you like them a lot. Listen, did you get the results back from your test?? Still sending purrs for ya. Take care. What a pretty outfit!! 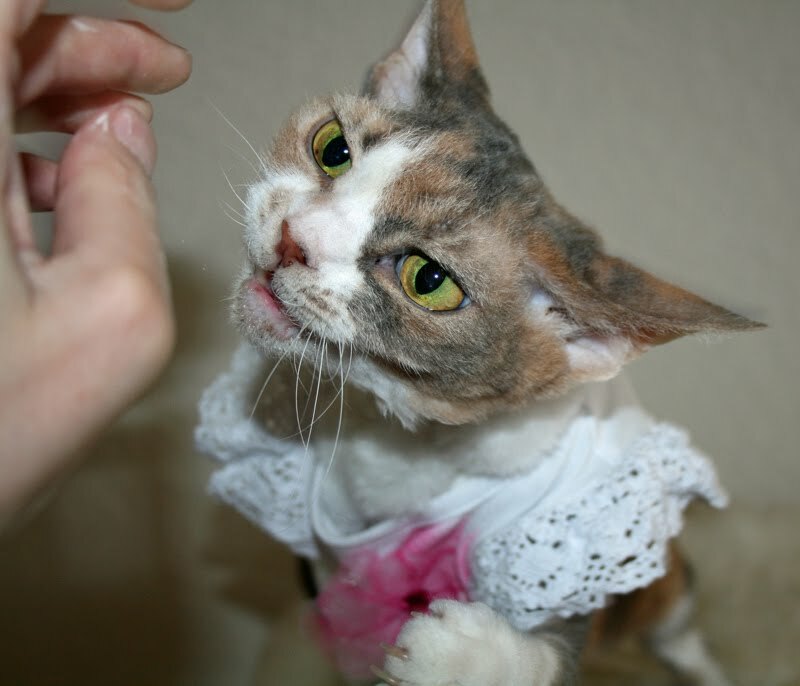 You've got your Mommeh very well trained with those treats! Only you could look stunning in a tee shirt, Daisy. Maybe you can wear it to your outing next week. That shirt is so cute on you Daisy!! Daisy you looked beautiful in that lovely t shirt today. We loved your face in the second photograph you were so focused on the treats. Daisy, you are a true professional! And that shirt is adorable on you! I like lernin abowt teh modalling industreee behynd teh seenz. Espeshlly abowt teh crunchee treetz cuz they look nommy. Good luck wiv your potty. I nevar will unnerstand xacatly wats they hoomanz want wiv all da furz an bludz an potty they iz always taking from us - weeerd! 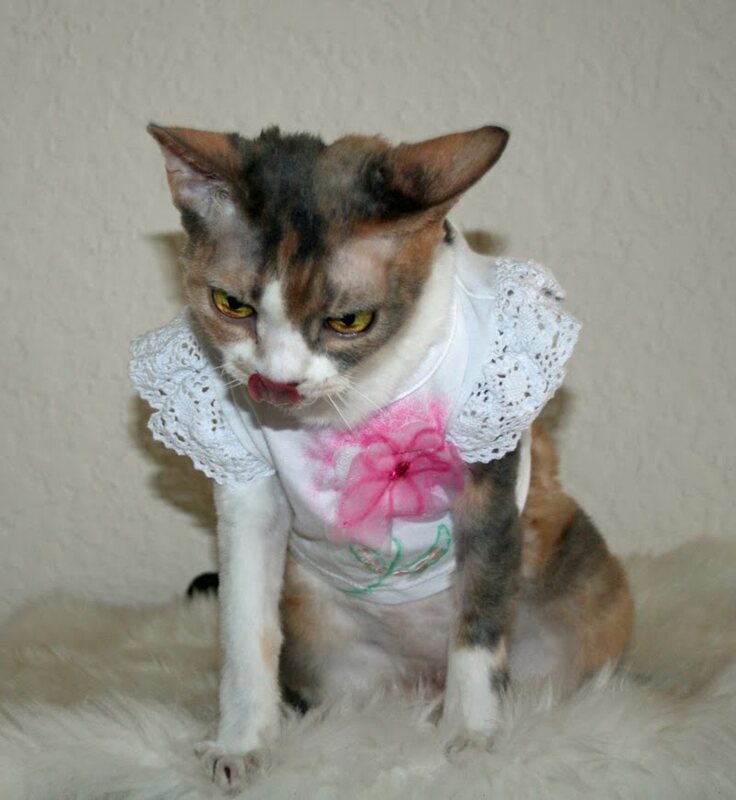 Daisy, you look lovely in your new tee-shirt, as always! You're a real clothes horse (so to speak). It's really cute to see you waiting for more treats with your little mouth open. Domino does not get treats for her modelling. 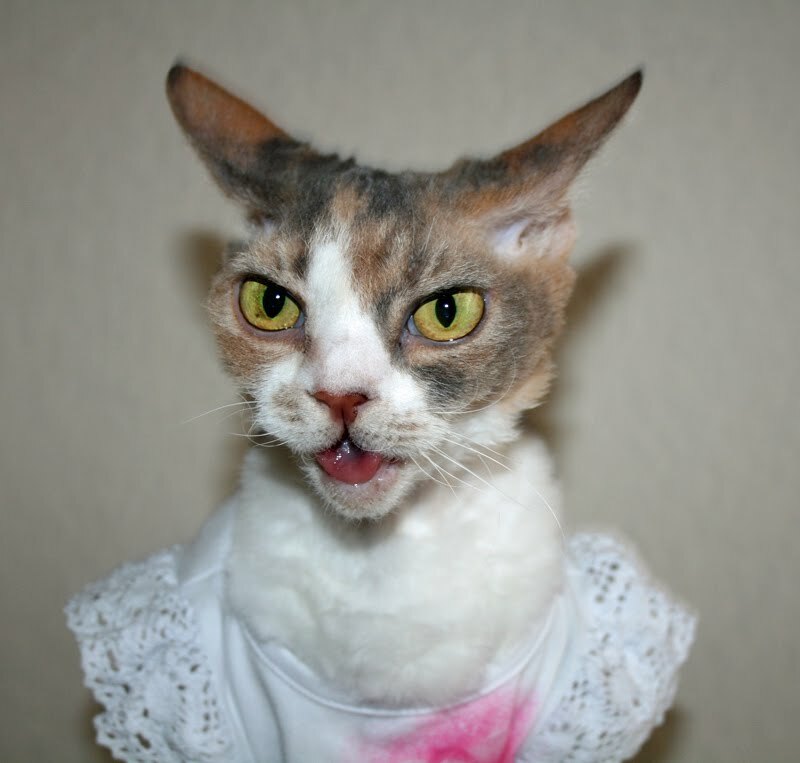 I think she really, truly likes to get dressed up. Daisy... that outfit is the best. Very nice on you. That is a very nice new shirt! Treats is good!! I liked to get treats!! We getted treats for laying down and staying. But only when She or He telled we too ... not just to had a nap. You're always a pretty model and very patient! Oh Daisy! You are so cute. You made our Mom laugh a little bit today. She has been sad, and you brightened her day. We love you and Harley! 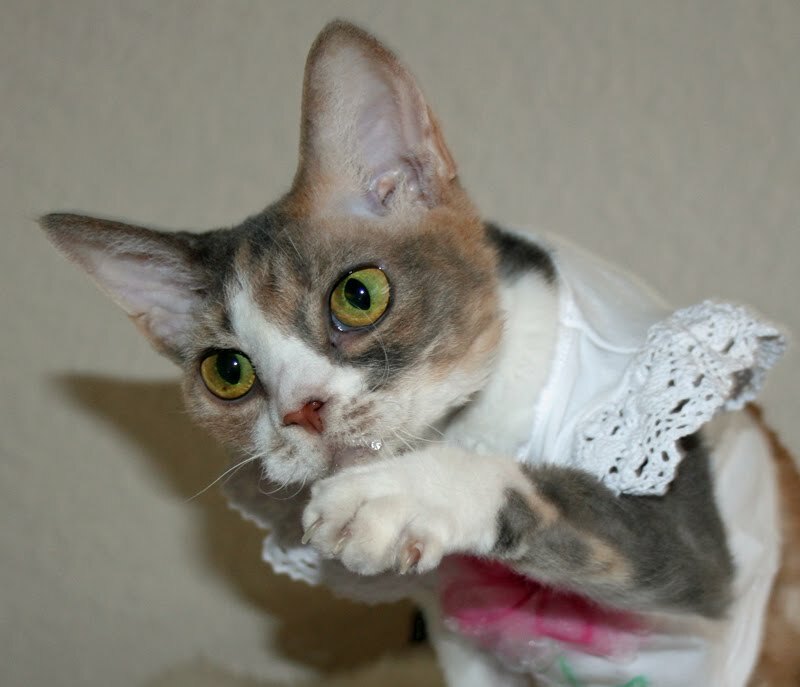 Daisy you look so adorable in your sweet dress with lace and the pink flower. Mommy loves seeing how much yopu love your treats too. That is a very cute t-shirt Daisy! I think you are lucky to be able to model for treats! Very cute shirt Daisy. Looks nice and cool to wear during the hot summer. We like how your paw is out in the fifth picture where your mouth is open. You must have been motioning to your mom to give you more. PS - beautiful shirt, and great modeling job as always. 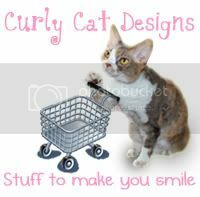 I did a cat caption of Daisy on my site. Feel free to come and steal it. She was my muse today. Such varied facial expressions, Daisy. Your crocheted top is lovely! Wow, Daisy, when you want your modeling pay, you REALLY want it! That is a prettyful top Daisy! I wonder if it would fit Leo...He would do anything for a treat and he is a good drooler just like you! That is a kyoot dress. But I mite like it better if it shode more of yer bodiss. Hey, sweet Kittypie, you were just awarded a special prize! cLiCkY-cLiCkY --> HERE! You are a demanding little model, aren't you, Miss Daisy? It is important to chew treats completely! We have to remind Mac and Kirby of this every time! Ruby says all yoor clothes are gorjuss! They must be verry nice treats! Daisy, you so sweet and so pretty. Your little outfits are always so cute! We dis wuz you so much. We wanted to be sure and thank you for coming to Pungy's Birthday Party. 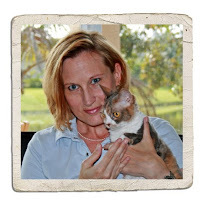 You were our first friend at the Cat Blogosphere. 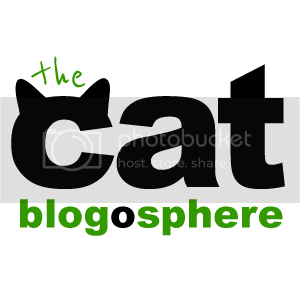 In fact, if it hadn't been for you being our friend, we wouldn't have our Kwee Cat blog now, and we sure wouldn't have all our wonderful friends from the Cat Blogosphere. You are the best, Miss Daisy. (((Hugs))) and purrs, to you Daisy. We will always be your devoted fans. Thank you. You and your family have a good weekend, pretty girl. I love your t-shirt Daisy. I think the sleeves might be lace. you look so funny Daisy with your tongue tip showing and your mouth open. Daisy, you have beautiful eyes, fashionista kitty! Only if all kitties could me models..
Daisy, you do such a good job modeling! You always look so pretty. Thank you for coming to our First Birthday party! Daisy yur the khutest model. always get yur payments uppfront.